Everyone loves Bacon. Okay they should love Bacon. This Bacon Scarf should make all the Bacon lovers out there happy while keeping them warm and toasty. This pattern should be a little free form so if you don’t know what I am going for, it’s okay. If you get completely flustered, let me know and I will help you as best I can. Note this pattern allows for a lot of improvisation. Feel free to change colors at random and add extra rows. 16. Using both colors and H hook, SC row. The friend I made it for really liked it. I love this, I recently decided to make my niece a Bacon scarf, but the only ones out there were a huge intarsia chart or they were just striped. This one has great texture and is only two colors, but the two.strands together rows are genius. I am working on it with a brownish red chunky yarn and an off white tan-ish Homespun. It’s looking great, ill have to email you a picture when its done! There’s several site which have compiled Bacon scarf patterns, and your pattern isn’t on any of them, but then this one is much more recent. Great work, I love it!!!!! I’m so glad you like it. I like that it allows for a lot of flexibility. You can make it thick or thin and change the colors up at random. Please send me a photo when you finish. I am trying to develop a reader made section so people can see how other’s projects have turned out. What is the email address? I’m accessing this though my phone and WordPress is not cooperating very well. Dear Aunt Wendy, You are a genius and we wish you were OUR drunken Aunt Wendy! Thank you for the pattern! That’s so nice of you. I’ll happily take on more nieces and nephews. Thank you so much. I hope she loves it. Hi Wendy, I have a couple of questions regarding this pattern. I love it btw, I love that it looks like real bacon rather than just a ripple scarf in red and white. First question- Do you only need one ball of each color of yarn? You don’t list a quantity in your supply list. Second question- In rows 10 and 18, you say to switch to hook E, but your supply list calls for a G and H hook, no mention of an E.
Could you clarify this to me in an email please? I really appreciate it. Also about how long is the scarf once its done? I adore this. Thank you for being so generous and sharing your porky genius! Oh my god this is so cool! It isn’t like a lot of other bacon patterns that just have stripes or whatever, this ACTUALLY looks like a strip of bacon. I think I’ll have to make this for my meatatarian friend for her birthday, haha. Great pattern! One question. In the pattern there is a g hook and an h hook. It says e hook on Row 10. Is that supposed to be G? I made it with an E hook and a H hook. Use the small hook when you are using one color and use the larger hook when you are using two colors. Thank you! =) I really like the pattern! How do I locate this pattern? All I see is the pic and the link to this page. The pattern is in the text of the page you commented on. Here’s a short link. Oh my goodness! 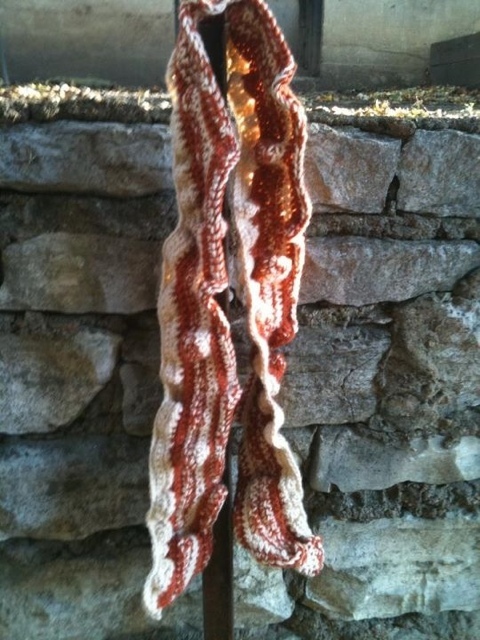 Love, love, love this bacon scarf! I was asked to make a bacon scarf for a fb friend, but all I could find was striped ripple patterns…blah! This fits the bill perfectly!!! Your work is amazing!! Thank you so much. I was having the same problems when I was searching to make one as well. I am glad you like it. Enjoy. Awesome scarf! How much yarn did yours take? Sorry if I have overlooked that part. How many balls of wool would I need to make this great scarf? You can email me a picture at drunkenauntwendy@gmail.com. I’ll post it on the fan project page. Forgive me if this was already asked as answered: how many skeins of each yarn? Thanks! Thank you so much for the pattern? How many skeins does it take of each color and do you just change the color sequence at random? Thanks a lot! I used less than one of each. If you want your bacon to be your own individual scarf, feel free to change the colors at random. I wrote down in the pattern when I changed them. SO AWESOME! I had some of Vanna’s Choice new Brick color, and it looks super awesome! Once I take better pics I’ll send them. Next one I’m going to do the “curly fat” rows on both sides. It’s super great as it is, but I love that you can make a whole bunch and have them all be slightly different. Just like real slices of bacon! I’m so glad you like it and had fun making it your own. Your fried egg hat is a nice addition. Great pattern! I might try knitting one. I can’t wait to see it. I hope your co-worker loves it. I love the look of your bacon scarf, and I’d love to make it, but I do have a few questions. How long is the finished scarf? In the beginning of the pattern, it does not say which hook size to use. Would I start with an E hook? I hope to hear from you soon, thanks! It ends up being about 48″ long give or take. You start with the E hook. Have fun making it. Increase means two stitches in one stitch. I hope it turns out. Let me know if you have any more questions. I am dying over your creation!!! It is the most realistic bacon scarf I have ever seen!! I want to make this for a male who is y’all and large. How can I make this longer? Any advice would help!! Thank you sooo much!! I am so glad you like it. It was a lot of fun to make. Start with a longer chain. Then adjust the pattern by how many you increased either at the end or beginning of each row, It is a fairly freeform pattern. I have a few unworked stitches left….. I would just SC the last couple of stitches. It was a really free form pattern. I never tested it. Any time you run into left over stitches, just SC them.